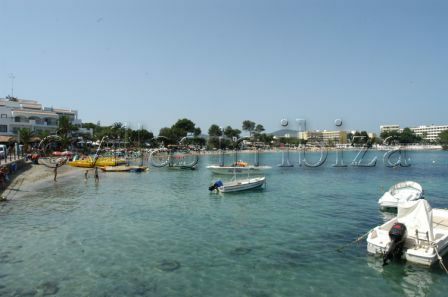 Es Cana is just a five minute drive from Santa Eulalia on the east coast of the Island. Plus you can catch a ferry to Ibiza Town, Santa Eulalia or even Fortmentera. As you would expect, the sea is crystal clear and if you go towards the edge of the beach you are likely to find yourself surrounded by fish. It's the perfect place to enjoy Ibiza’s sun sea and sand. With an abundance of water sports operating throughout the summer, the beach comes to life as soon as the season begins. Whether you enjoy spectating on the shore or participating in the sea, the elegance and speed of the kite surfers, wind surfers, the classic banana boat and sailing boats will never cease to amaze. Surrounding the beach is a variety of family holiday resorts. There are restaurants and bars a plenty in the town, all child friendly, with a selection of shops selling beachwear and equipment. If Arts, Craft and Culture are more your style, the Hippy Market runs every Wednesday, providing hair braiding, handmade clothing, ornaments and much more. Es Cana’s exquisite beach and busy town is an ideal place for families and will not leave you short of beauty or entertainment. The hippy market is on every Wednesday and we took a short boat trip from Santa Eulalia to visit it. The market is full of clothes , jewellry and plenty of interesting characters who are willing to bargain for their wares. Well worth a visit.